This keeps happening when we leave weeks of smaller cities and towns in Southeast Asia: we got to Singapore and WOW! Colors! Lights! Look, a Banana Republic! And the costs – my God!. Meals here are at least 50 percent higher than where we’ve been in Thailand, probably more like double the cost. Last night we paid something like $14 each for the smallest Perfect Manhattans you’ve ever seen. The bartender asked if we wanted another and I boldly asked “Will the second be bigger than the first?” He agreed, and so there you are – being direct (rude?) can pay off. Singapore is an interesting city-state. 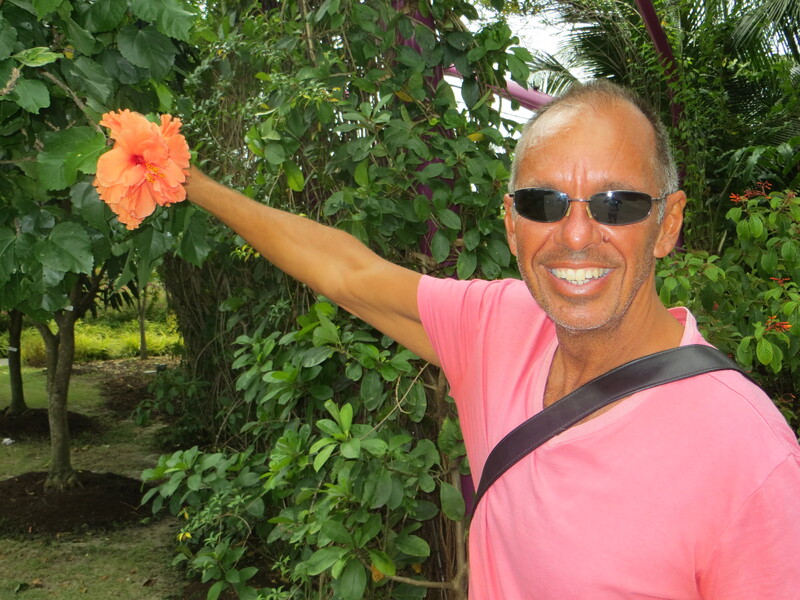 It’s just one degree north of the equator so the climate is pretty stable year round. (I should add that it hasn’t been nearly as warm these two days as I’d have expected; not sure what that’s about though.) Until the Brits came in the early 19th century it was pretty much just part of the Malay Peninsula, but they colonized it and brought in lots of English structure. 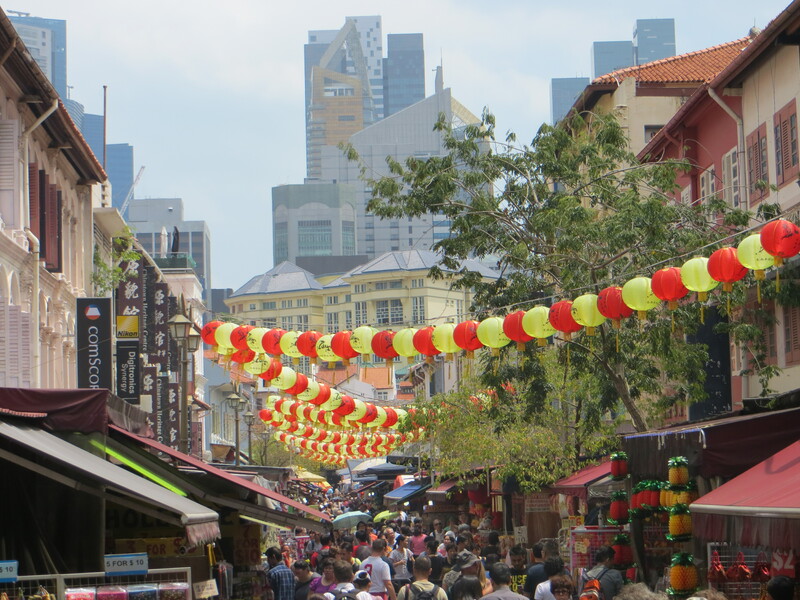 They brought money, and so Chinese – lots and lots of Chinese – moved down here to trade; today the city is something like 85 percent Chinese, with the native Malays being a very small minority. And as far as I can tell from this brief experience it is as much a first-world city as just about anyplace you could imagine. A nice little reprieve from most of our time in Southeast Asia. It seems odd to me to have a Chinatown in a city that is overwhelmingly Chinese, but here it is. 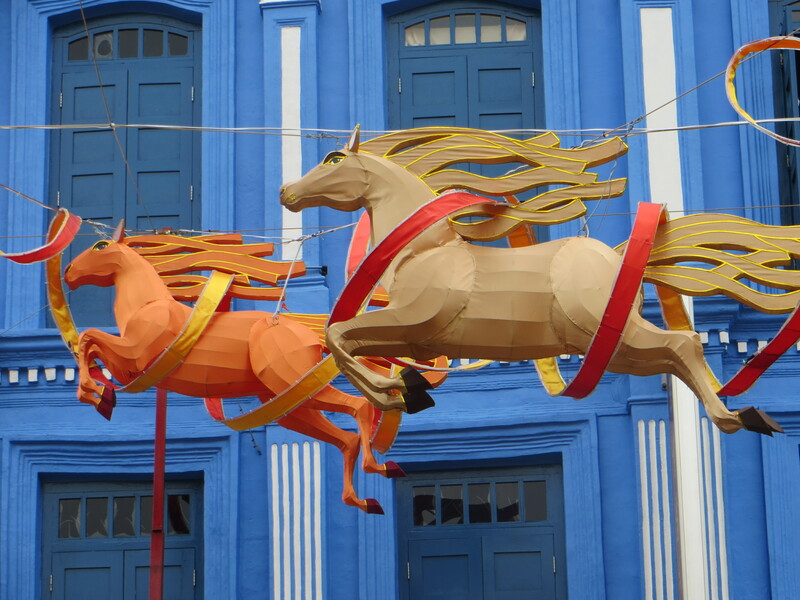 Imagine our surprise to learn that Chinese New Year’s – bringing in the Year of the Horse – is the day-after-tomorrow. There are horses all over the city. Normally we wouldn’t have jumped from Thailand all the way to Singapore and then started working our way north up the Malay Peninsula, but we’re meeting Mark’s dad and brother tomorrow morning, and it just worked best this way. So this has been a pretty short visit to such a great city, but there have definitely been some highlights. 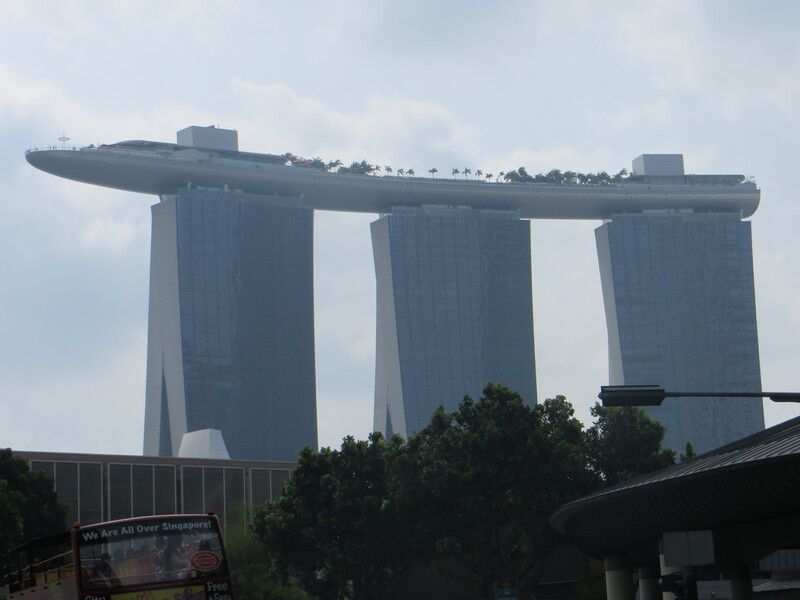 The Marina Bay Sands Hotel is this amazing three-tower behemoth topped by what looks like an oversized surfboard, on top of which is apparently a ginormous SkyPark of swimming pools, palm trees, day beds – everything you need 60 floors above ground level. We didn’t go up there but the views from the ground were really something. Often unusual, modern architecture doesn’t work but for me, this sure did. Three towers and a big surfboard on top hosting a huge elevated park. If you can ignore the fact that it’s owned by Newt Gingrich-sponsor Sheldon Adelson, it’s pretty cool. Then there was the Gardens By the Bay, a new 250-acre park that includes lots of great outdoor space but also two climate-controlled domes, a Flower Dome and an artificial Cloud Forest. The latter seemed kind of lame and gimmicky to me, but the Flower Dome was a grand slam home run. 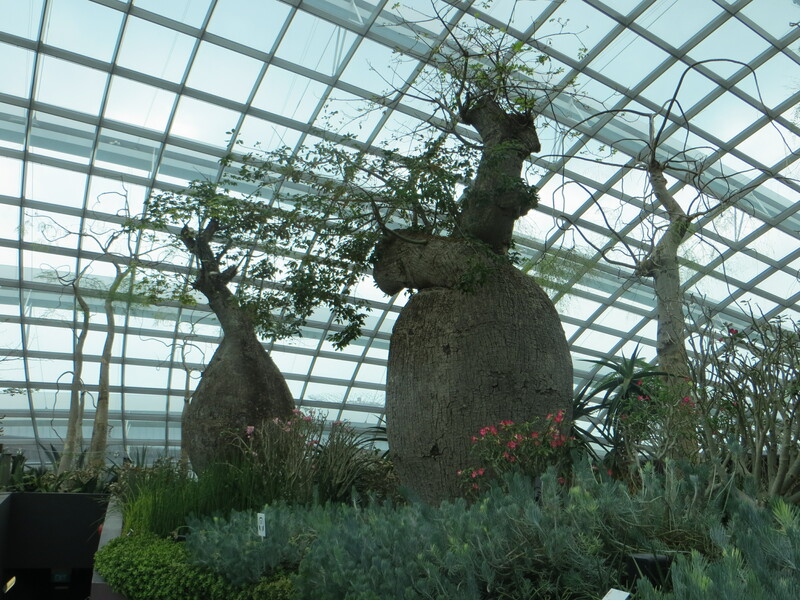 One section was succulents and “bottle trees,” including what I think are the first Baobabs I’ve ever seen. Another section was a California area that I swear smelled like San Francisco. Then there were Mediterranean, Australian, and South African sections, all in this great space with appropriate micro-climates. Very cool. And beautiful. This was one of my favorites. 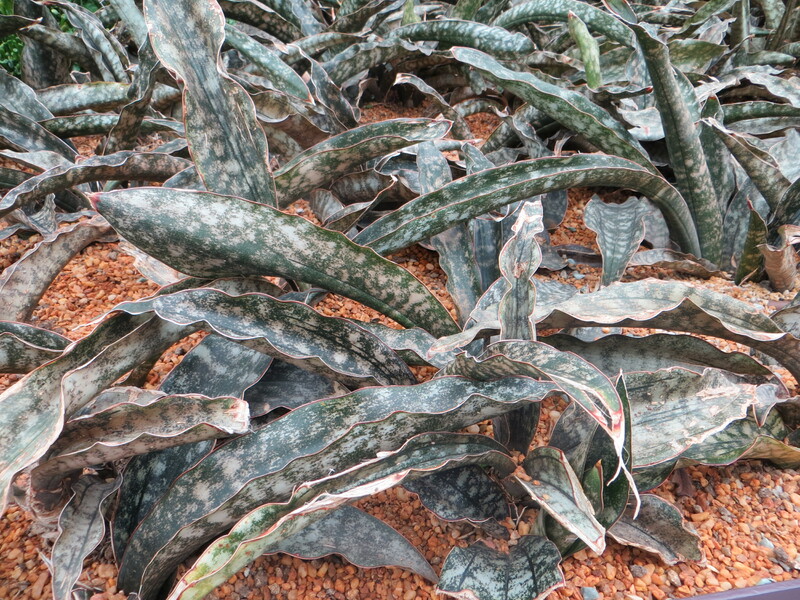 A succulent whose survival adaptation is to look dead or at least dying so predators will leave it alone. It worked – I thought it was really ugly. Some of the “bottle trees” in the Flower Dome. They evolved in arid climates to store moisture in those bottles, which is why you don’t see any of them in Minnesota. Tomorrow is Chinese New Year’s Eve as we move into the Year of the Horse. 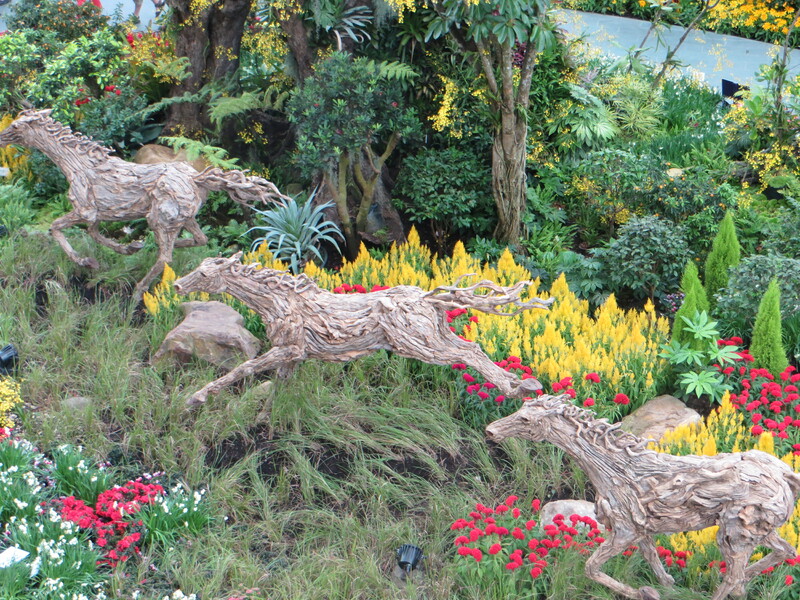 So there were lots of horse design around the city, including here in the Flower Dome. 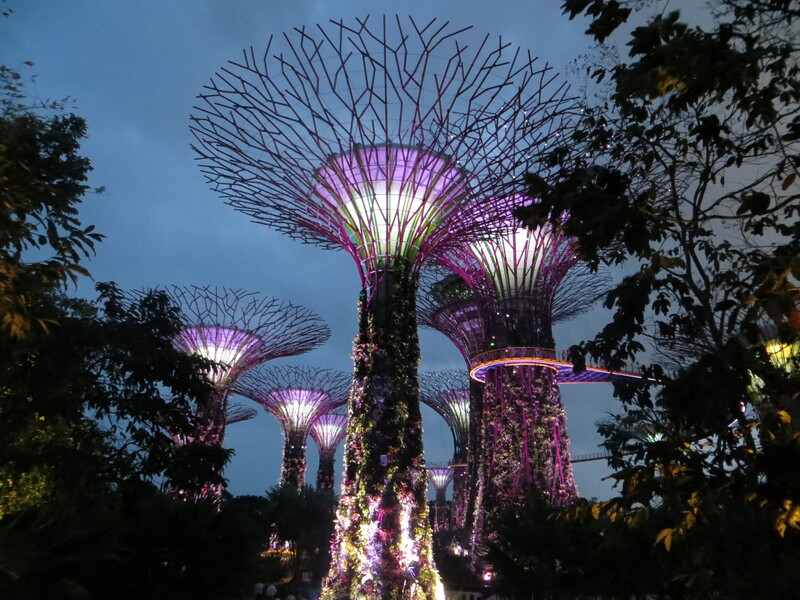 Another highlight of the Gardens By the Bay was the Supertrees Grove, structures as much as 150 feet high, that serve as vertical gardens. At night they do two 15-minute light-and-music shows that were fun. Today we spent time in Singapore’s Asian Civilizations Museum. When we got our tickets we were told that there was a free guided tour of the Southeast Asia gallery starting in five minutes, and while I often get frustrated with guided tours we decided to give it a try. It was perfect. Suzie, the docent, is from LA, so her English was pretty darned good. On top of that she was fun, interesting and knew her stuff. And just to make it perfect, she kept it short – 35 or 40 minutes, hitting a few highlights in the gallery and then we were on our own. So that’s been our brief experience in Singapore. I’ve been running pretty regularly and this is a pretty good city for early morning runs though at about one degree north of the equator I’m not eager to run midday. And then tonight we’re going to hit one more highlight, or at least I hope it ends up a highlight. Or high-dark? We’re going to Nox, a restaurant where you dine in the dark. Not just dimly lit, but dark, as in pitch black. No light at all. And I thought the artificial cloud forest was gimmicky? This gets great reviews, though. The wait staff are apparently all blind, and they guide you to your table and help you settle in – just like they do all the time. Stripped of vision, in theory your other senses are enhanced, giving you a very different experience with the food and wine. At a minimum it should be a memorable experience and I don’t have to worry about what I wear! 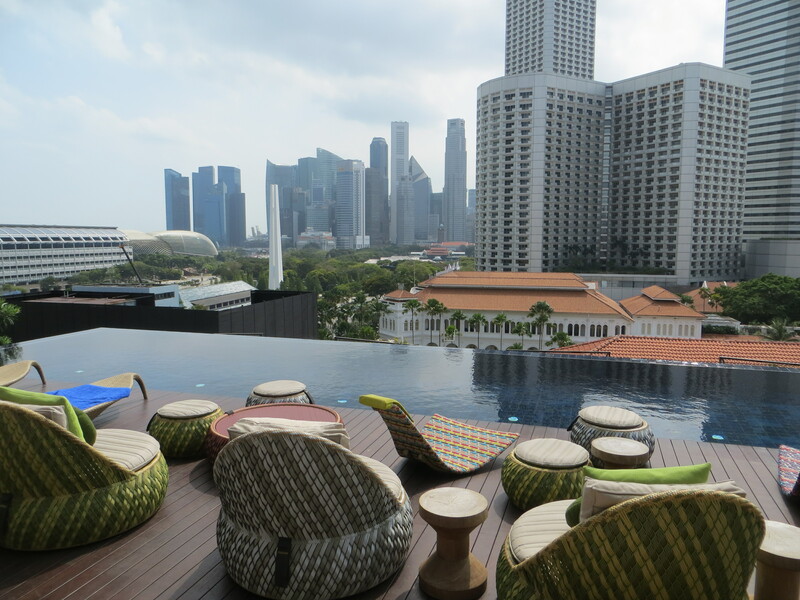 The view of downtown Singapore from our 10th floor pool. The white low-rise building right in front is the Raffles Hotel, the most famous and storied hotel in Singapore AND the origin of the Singapore Sling. Then the white obelisk near the center is a tribute to Singaporese who died during the Japanese occupation during WWII. It’s been a real learning experience to keep running into these memorials all over Europe and Asia to that horrible war and the awful things the Germans and Japanese did. I think it’s a tribute to our ability to forgive and forget that people don’t still hate them. Of course, as an American who’s traveled in Vietnam, I’m glad we have that capacity….